Dude can you please try to fix the lycanroc thing? This is one good game im itching to play, but just cant enjoy it completely without some of my favourite pokemon in it. -Rockruff's evolution to both Lycanroc forms is fixed, but different from the main games. I just cant seem to get the midnight form no matter what.Does it have anything to do with my rockruff's stats? If anyone else already have a mighnight lycanroc (and its not a problem with the game) please tell me how you got one!!!! Fixed it in the new update! Rockruff will now evolve into Midnight form correctly! Just level it up at night. Hi, just got a few questions. 1. Can i evolve my pikachu into an alolan raichu? If so how? 3. Is greninja ash in the game? Just found that greninja's water shuriken is a physical atk instead of special. 1. You can evolve Pikachu into Alolan Raichu by leveling it up in the Grassy Path or Sunshine Path. It's both on the resort island. Regular Raichu is still obtained by Thunderstone. 2. Ability Capsules, even in the main game, never changed hidden abilities. I can make hidden abilities easier to find, however! 3. Ash Greninja isn't quite available, but totally possible! 4. Oddly, in the main Gen. 6 games, Water Shuriken was Special. I didn't know it changed in Gen. 7! Gotta fix that one too. 1. In the hot springs i can see a mega stone but i cant seem to reach it. Is it supposed to be that way or is it a bug? 3. Greninja cant learn Ice Beam from TM. 4. In many cities when you enter inside one house and then exit it, you seem to exit from a different house in that city. 5. Beast boost doesnt work. 6. In the 8th gym when i interact with the first guy(first trainer), he keeps on saying the same thing and game gets stuck. Plus i would love to see a greninja-ash in the next update! 1. I'll move the Mega Stone in the Hot Spring in the new update. 2. I'll fix the walkable tile in the new update. 3. 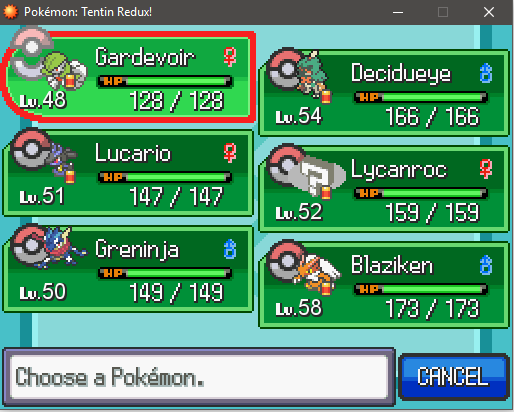 I didn't add Gen. 6 and Gen. 7 Pokemon to the Ice Beam list, but now I will! 4. I'll look more into the warps, and I'll fix them! 5. For sure, I thought I added Beast Boost! I'll get to making it work! 6. I fixed the Trainer in the Shashine Gym in the new update! 7. Ash-Greninja will be included in the new update! Very sorry! Forgot to mention one small thing! When i have a midnight lycanroc in my team, i cant seem to view lycanroc's image when i go into the "pokemon" section in the menu. Instead it displays a question mark. I can view its sprite during battle though. Yeah, that's because there's no icon for Midnight Lycanroc. It's a placeholder until I can find one. 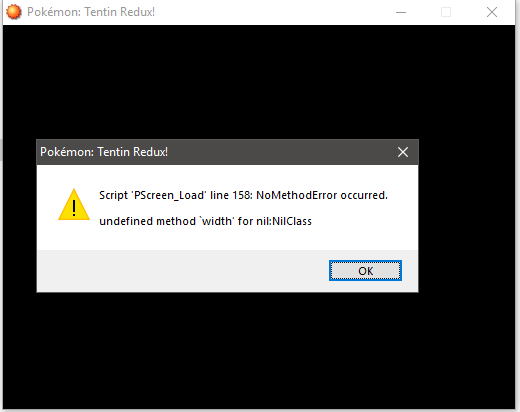 Error, huh? I guess didn't catch that one. I'll try to quickly fix it. Though that's a weird one. Got a suggestion? I just checked, I didn't get the error when I open up May 25th version. Problem on your side? I can't even seem to get the pop-up. Just redownloaded the file and i dont seem to get the error msg now. Wierd. Ty Anyways XD. I beat the champion a day ago and was wondering if there is any activity post game. I went back to the a city and i battled the talking Ludicolo. Is there anything else we could do post game? One more thing, the mega stone in the hot spring was an audinite, but i already got an audinite from another city. Please replace it with another mega stone in you free time! You beat the Champ! Was it too hard? Too easy? On the other hand, I was working on another update to.add post-game, but I've still got things to figure out. I also replaced the Audinite with a Heracronite! You can't enable debug mode on this game. Only I can because I made Tentin Redux! But would you want a way to edit stats in-game? Yes, if possible. It's only to have fun and test some combinations of pokemon. This menu for example. You need to enable debug mode to use it. You obviously know that.